When we feel down or anxious, there are heaps of things we can do to help us feel better again. Doing these things can help prevent everyday mood disturbances from developing into mental health issues, such as depression and anxiety disorders. When you tell MoodMission how you're feeling, it gives you a tailored list of 5 simple, quick, effective, evidence-based Missions to improve your mood. All Missions are taken from scientific research, made accessible to you through the app, so you can learn exactly how what you're doing is helping. Completing Missions earns you rewards in the app, motivating you to take steps towards becoming healthier, happier, and more confident. In October 2015 we launched a crowdfunding campaign on Pozible to fund the development of MoodMission. We received an amazing response when 207 amazing pledgers showed their support for our app by helping us reach our target of $20,000. Since then we've been hard at work building and improving the app with the help of Spark Digital, and on the 17th of August, 2016, our work paid off when MoodMission was launched on the iOS App Store. Soon after the iOS release we heard the calls from so many folk desperate for MoodMission to expand to Android. In fact a post on Imgur recevied over 300,000 views, and thousands asked for an Android version. A crowdfunding campaign was successful raising funds for developing an Android version, which was released with great excitement in early 2017. We have since published three papers in academic peer-reviewed journals reporting the effectiveness of MoodMission. This includes a randomised controlled trial (RCT), which showed that MoodMission was effective at decreasing depression and increasing mental wellbeing. We are now pursuing new features for MoodMission, including support for organisations who want to use MoodMission in the workplace and mental health professionals who want to use MoodMission with their clients and patients. We believe in a future where people have easily accessible support to change the way they feel. News about the ongoing development process will be posted on our blog, our Facebook and Twitter accounts, and sent via email to our mailing list. Dr David Bakker is the Founding Director of MoodMission. He is a psychologist in private practice and has previously worked in rural mental health outreach, youth mental health, disability support, and a range of psychology services. 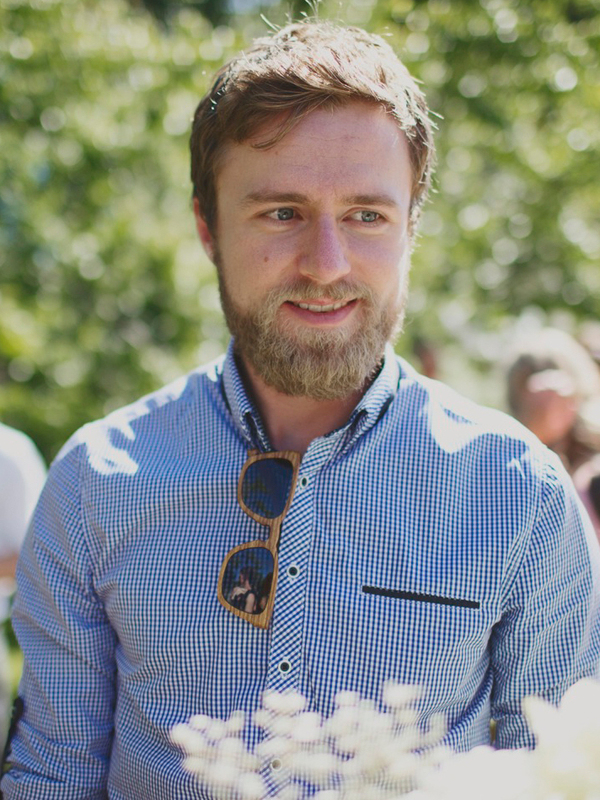 He is passionate about technology and the evolution of its use in mental health support. David believes that his fresh approach to mental health apps gives him an advantage over other developers. Many currently available mental health apps are replications of low-tech self-help mental health interventions, like worksheets and diaries. David is deeply interested in the advanced interactive capabilities of smartphones, and wants to pursue creative ways to employ them in mental health apps. He looks forward to integrating technology throughout his future clinical and research career. 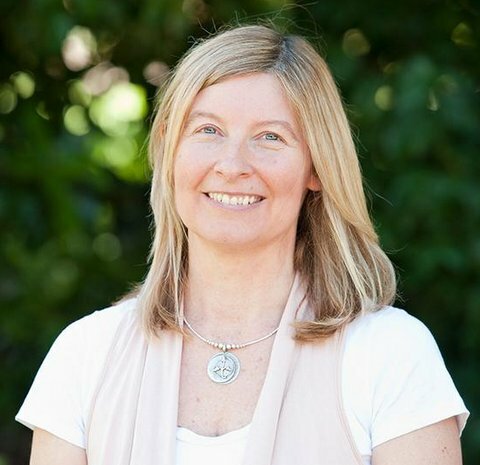 Associate Professor Nikki Rickard is a registered psychologist and an internationally recognised expert on novel interventions to promote emotional wellbeing, particularly in young people. She has an established track record in mobile app development, with in-house apps developed for research data collection and apps developed for public use. Her strong research background will ensure evaluation of the MoodMission app is robust and the resulting product maximised for efficacy. Alongside MoodMission, Nikki and David also belong to the team developing and supporting MoodPrism, a mood tracking app with advanced data collection abilities. 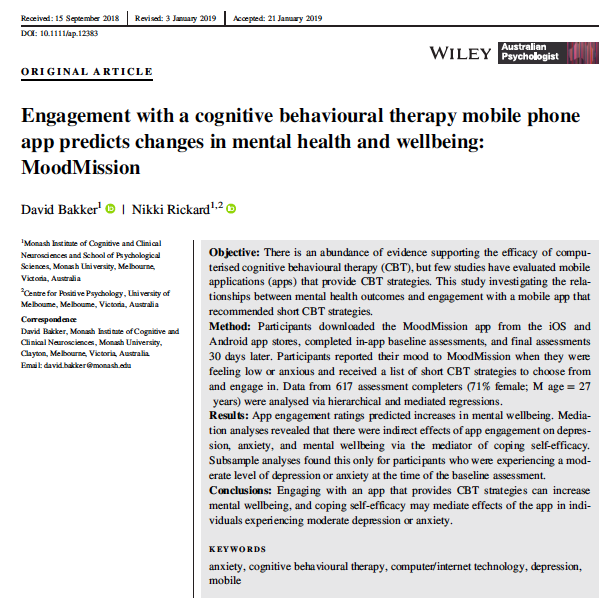 MoodPrism is now available for Android and iOS, and a recently published research article shows that using the app can improve mental health and wellbeing. David and Nikki developed MoodMission through a partnership with Spark Digital, the ingeniously creative app development agency behind the hugely successful Smiling Mind app and website. 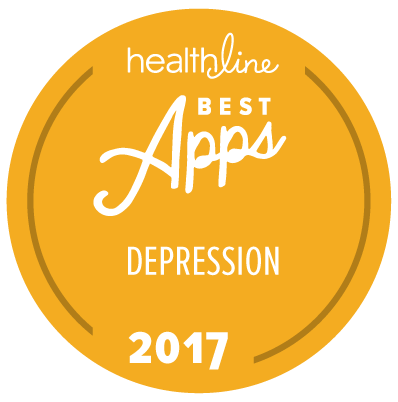 Smiling Mind is Australia's most successful mental health and well-being app, with over 1 million downloads. Thank you! We'll let you know about any important MoodMission news. If you have questions about the project that aren't answered on our FAQ page, would like to enquire about using MoodMission at your school, university or organisation, have any media enquiries, or would like to support the development of MoodMission, please send us a message. We asked some students at Monash University what they like to do when they're feeling stressed, anxious, or low.